After years of rigorous work on various courts, Rozelle Nix finally saw his dedication pay off this season. Pitt trailed by five with seven minutes left in the game against the winningest coach of all-time, Mike Krzyzewski, and the No. 21 Duke Blue Devils. Sophomore guard Cameron Johnson missed a jumper, but Nix was there to pull down his third offensive rebound. The redshirt junior center always wanted to play against the best Division I basketball teams, and it was finally happening—and he was actually succeeding. Pitt went on to lose, 72-64, but Nix finished with seven points and five rebounds over 16 minutes in the home of one of college basketball’s most storied programs and most rabid fan bases. Those aren’t exceptional numbers by any stretch, but the goofy, affable fan-favorite is a long way from where he was just two years before. The road to his breakout game against the iconic Duke program involved twists and turns and a great deal of hard work for him to make his way from Ohio to Florida and, finally, to Pittsburgh. The hefty Nix struggled with a weight problem that followed him all the way to his graduation from Withrow High School in Cincinnati. At one point, he was pushing 400 pounds, preventing him from receiving much interest from Division I programs. Rather than quit the game, Nix pushed himself to get in shape with help from his loved ones. 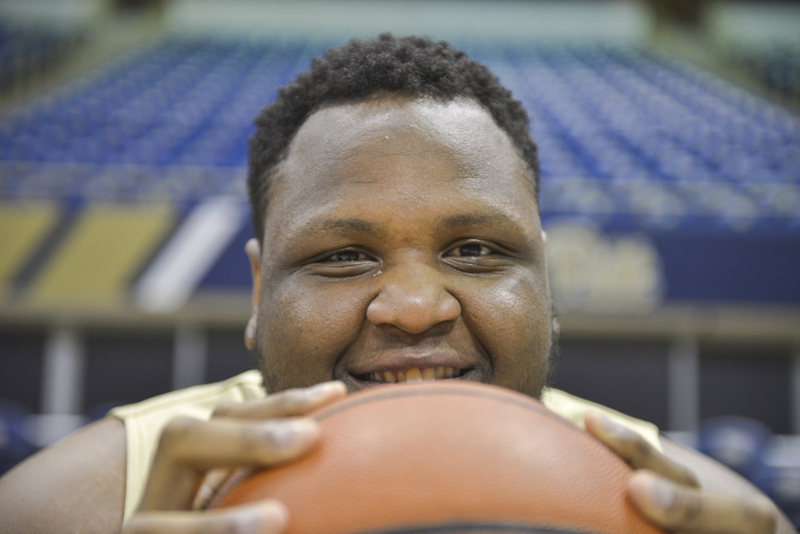 Pitt sophomore guard and Nix’s best friend Damon Wilson says “Big Ro” hasn’t stopped managing his weight since becoming a Panther, despite already having lost nearly 100 pounds. Nix attributes much of the grit and resilience that enables him to work so hard to the influence of his late great-grandparents. During the first two years of Nix’s college career at Pensacola State Junior College in Pensacola, Florida, he dedicated himself to improving his game and continuing to lose weight. His hard work paid dividends, as he earned first-team All-Panhandle Conference honors following the 2014-2015 season. His efforts eventually landed him a three-star ranking according to Rivals, announcing to the world that he had the ability to play at the top level of college basketball. Soon afterward, the offers started to trickle in. Loyola Marymount University in Southern California and the University of South Carolina expressed interest in Nix, but he turned both schools down. Eventually, he decided to transfer to Pitt prior to the 2015-2016 season. Nix was attracted to Pitt by the school’s proximity to his childhood home in Cincinnati. “Pitt gives me the opportunity to play at the highest level and it is close to home, so I like it,” Nix said. He’s formed deep friendships with many of his teammates but none closer than that with Wilson. A preseason foot injury forced Nix to redshirt in his first year at Pitt, but he continued to press on after his injury. Nix’s penchant for hard work quickly endeared him to teammates like Wilson and senior forward Sheldon Jeter, and the junior college transfer had no problem fitting in with members of the team — most of whom had been scholarship players at Pitt from the start. When he’s not hanging out with Jeter or Wilson after a practice or game, Nix is probably at home watching TV or playing NBA 2K. But he has another hobby that people might not expect for a man of his stature. In Durham, North Carolina, the Pitt Panthers felt the verbal blows Duke fans launched their way. It was in this hostile environment that Nix finally got the chance he had waited so long for. One person who was not surprised about Nix getting minutes was Wilson, who had seen his friend’s work ethic first-hand. Panthers fans might remember another powerful post presence who made the move from Pensacola to Pitt in the glory days of the early 2000s — graduate manager Ontario Lett. Lett was a two-time first-team All-Panhandle selection in 2000 and 2001 before helping lead the Panthers to back-to-back Sweet Sixteen appearances in 2002 and 2003. He returned to Pensacola as an assistant coach in 2014-2015 for Nix’s sophomore season, overseeing his development into a Division I prospect. Nix said Lett has played a big role in helping him rise from a junior college standout to a productive player in the ACC. Nix knows he likely won’t play basketball forever, but the justice administration major has contingency plans. Currently an enforcer on the court and potentially one off of it in the future, the gentle giant has become a cult hero at the Petersen Events Center – where he has offered a reassuring presence during a disappointing season. The Oakland Zoo escalates into a frenzy every time Nix sheds his warmups and makes his way to the scorer’s table.